I took a few more photos of my space, to give you a better look at how I have it currently organized. Maybe you'll find some ideas for yours or just enjoy the peek. I don't have a very big stash - what you can see here and another pile on the next shelf up. For now I usually use fabric as I buy it; stuff on my shelf I fell in love with in a quilt store or was given as gifts. I'm slowly working at using this up! 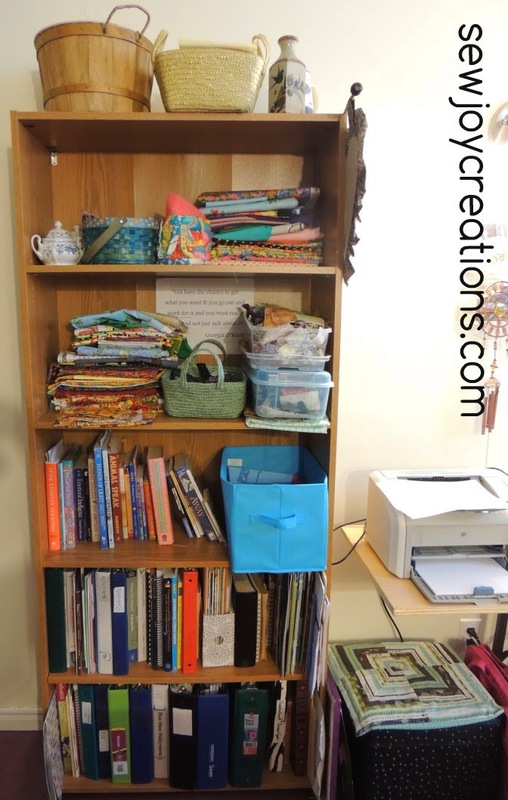 Beside the book case is my sewing table. It's a wide shelf on legs we bought in a hardware store. Originally we made this table when we had a booth at a farmer's market selling fair trade coffee. 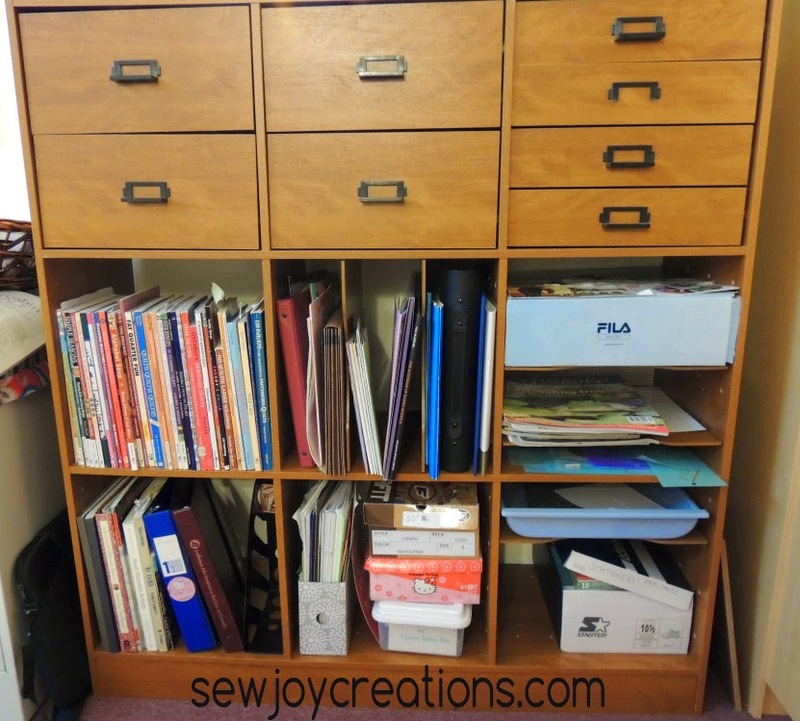 Under the printer end of the table (with a Selvage Joy Pillow cover on it) is a sewing storage box that my mom gave me. I'm pretty sure it's from someone in the family. I put the cover on it so my cat can sit there! 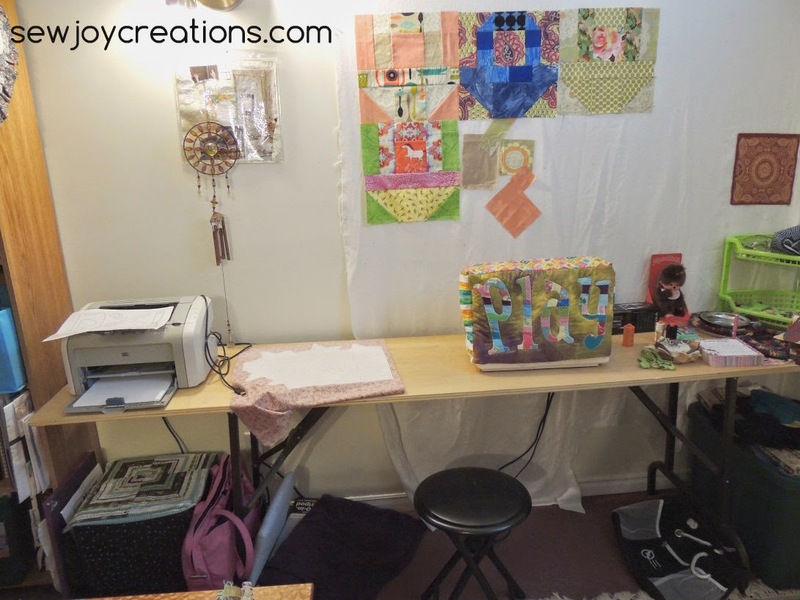 You can see my design wall which is a large flannel sheet, my sewing machine, and the stool I currently sit on when I sew. 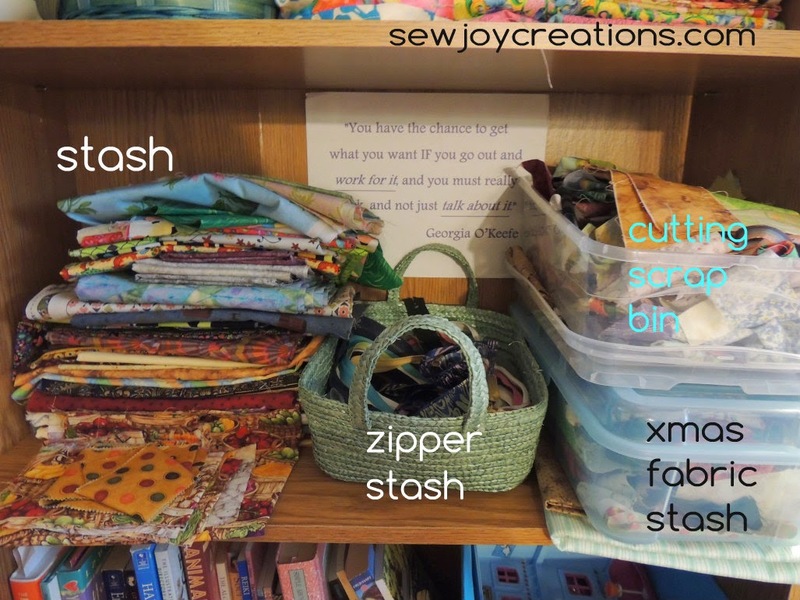 In the corner is my plastic tub that holds fabric for special projects. 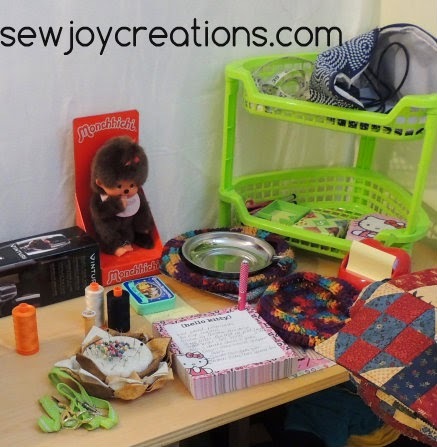 To the right of my sewing machine is all the little stuff that needs to stay close - my pincushion, my hello kitty notepad, Aurifil thread, bobbins in a mint tin, my monchichi and the corner basket that holds my camera, measuring tape and safety pins. And my bird scissors on a lime green lanyard! My ironing board wall is viewable from the opposite end of the room which is our family TV room. I tried to make this wall more "pretty" and not all function! You can see my orange desk (with my colour printer on its bottom shelf). This wall has one of my free outlets so my iron, printer and computer all take turns plugging in! 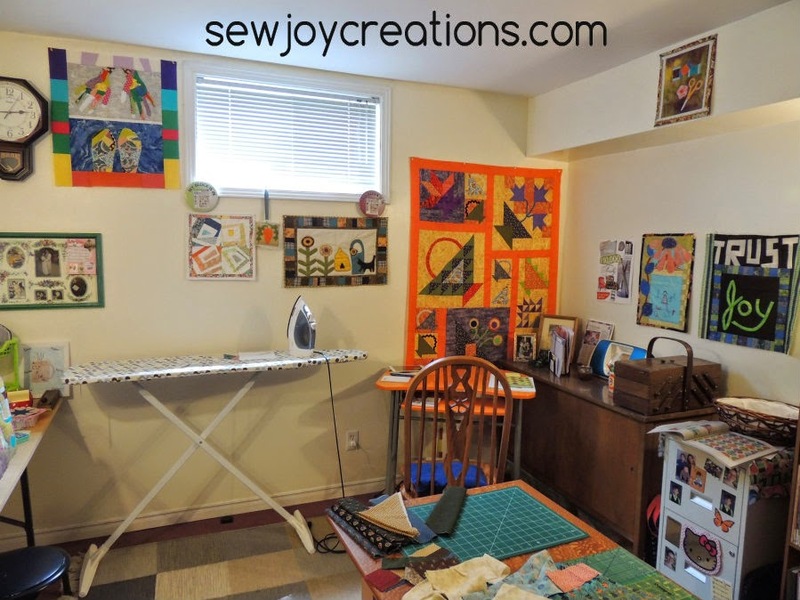 The far wall has a cabinet where I display more quilts. 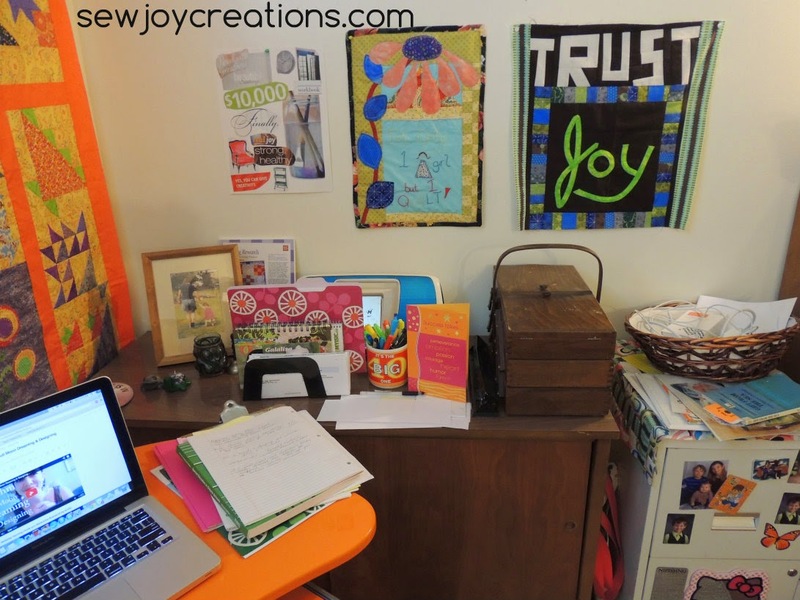 My orange desk rolls out of the way when I want to get into the far door beneath where all my quilt magazines are stored. The basket bin on top of my filing cabinet holds all the cords I need for charging all my devices. 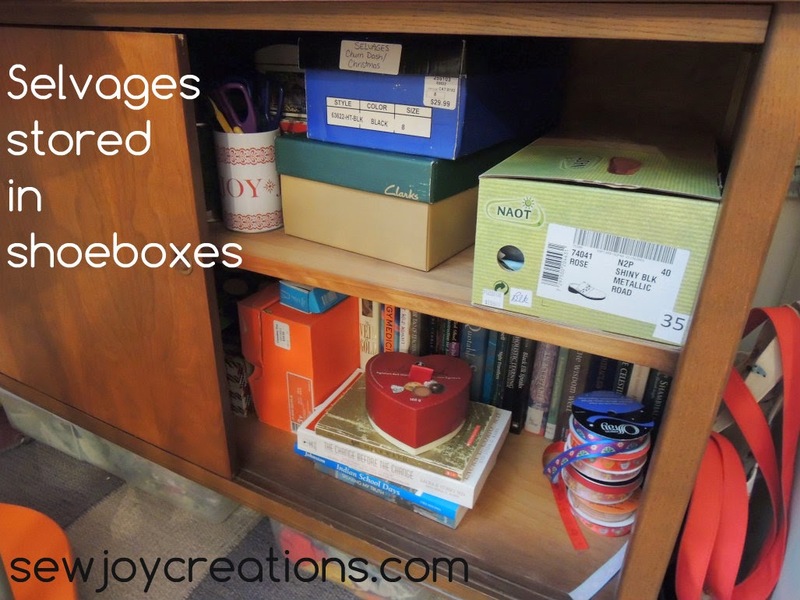 The near door holds my selvages in shoeboxes, ribbons and books. I keep my handstitching supplies in here as well. My new storage unit is great! I can't believe I had enough different little things to put in the drawers - a drawer of sticky notepads, really! This is the top of my new storage unit - again trying to have some pretty, inspiring things on display. This is my final storage cabinet. It has doors so that lets me keep it a little bit messy - and hide projects and presents inside! 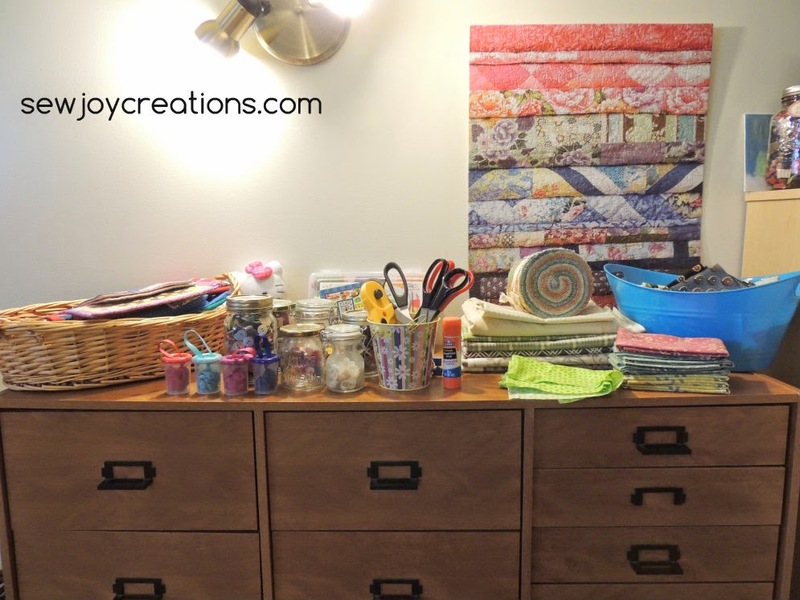 The bottom shelf has my quilt tops - the bin is my daughter's stash. 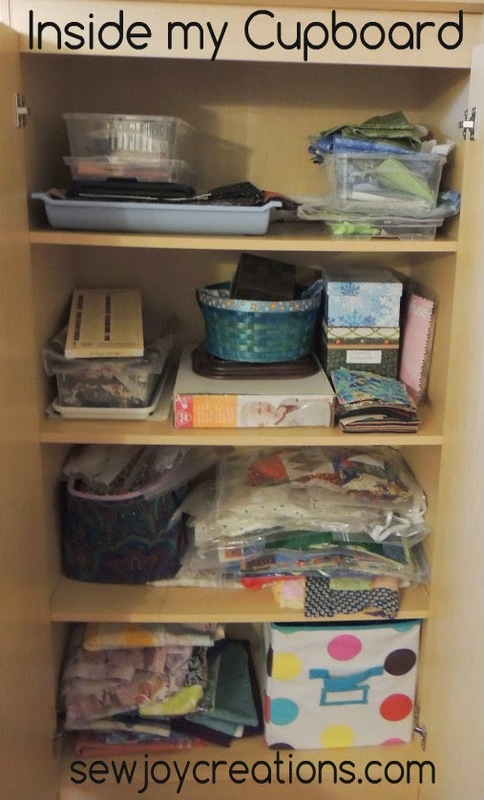 The second from bottom shelf has my UFOs in plastic bags and a fabric bin that has project leftovers that I've kept. 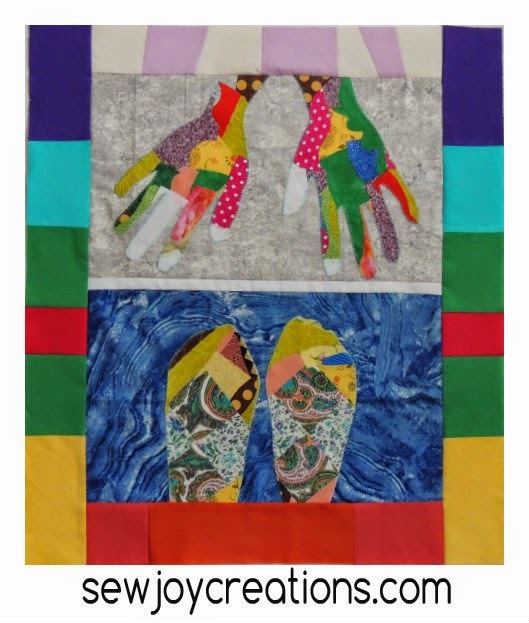 These leftovers were used when I made my Soul Art day quilt. In the middle of my space is my most special piece - my cutting table that my husband made me in woodworking college. It's beautiful, inspiring and functional! 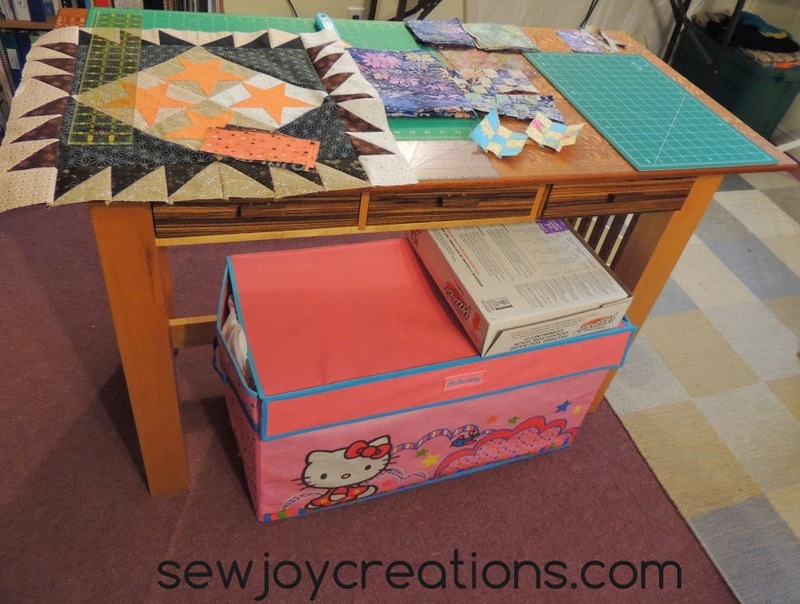 My hello kitty soft sided toy box holds more quilt projects - my Halloween 1904 blocks are in here - as well as my batting. I love how the divider fits and helps me keep it organized. 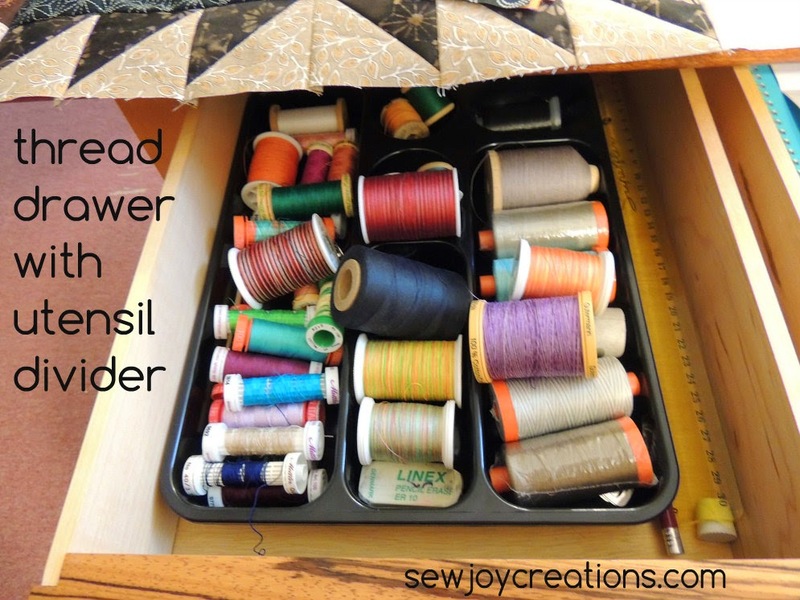 My ruler and sewing pencil I use to draw lines on my half square triangle units gets stored in here too. 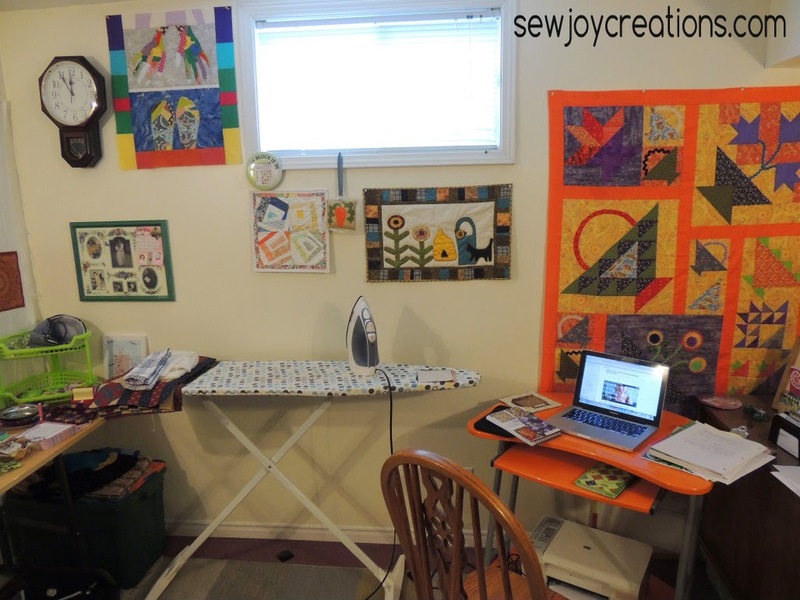 It is amazing how much stuff we quilters need, isn`t it!! great space and you have it so well organized. That cutting table makes me a bit green with envy, it is so nice. Lucky you.